In 1956 I happened to read an advertisement in the Reading Mercury, inviting new members to join the Reading Branch (No.28) of the British Sub-Aqua Club. I had always been fascinated by the technology that enabled divers to survive underwater for prolonged periods of time, and this seemed to be my opportunity to sample the experience at first hand. I was immediately “bitten by the bug” after being introduced to the aqualung, for the first time, and joined the BS-AC. Finding Oxford also had a branch of BS-AC, (Branch No.34), which was nearer to Swindon, I transferred my membership and underwent some of my initial training with them, before joining them on several inland and coastal dives. Many of us wore woollen sweaters to protect ourselves from the cold water, the first generation of diving suits being out of our financial reach, costing between £10 to £15 and equivalent to a couple of hundred pounds by today’s prices. I soon realised that training to become a 3rd Class diver required more commitment than an occasional visit to Oxford Branch’s weekly training sessions, and decided to attempt to form a branch in Swindon. I contacted both Oscar Gugen and Peter Small, the two founder members of the British Sub-Aqua Club, and was told that I needed at least twelve members to form a branch. I placed a notice on the information board in Milton Road Baths in Swindon and also advertised in the local evening newspaper, resulting in just enough potential members coming forward to comply with this minimum requirement. I called an informal meeting at the Moonrakers public house, bringing together the nucleus of Swindon Branch for the first time. Following this, our first official meeting was held at Milton Road Baths on 11th April 1957 when officers and a committee were appointed, and our first training session was held at these same premises on 2nd May 1957. Not having a qualified diver amongst us, we enlisted the training skills of Bob Mos (of Dutch descent) who was a fully qualified member of Bath Branch (No.33). Living in Chippenham. Bob travelled twenty miles to Swindon every Thursday evening for several months, to train some of us up to 3rd Class Diver qualification, so that we were sufficiently competent to appoint our first Diving Officer, Ken Head. By this time we had one aqualung between us. At first we charged our cylinders by hand pump at the local fire station, but then found it easier to decant from large BOC cylinders., until eventually acquiring an ex American Army Ingersol Rand compressor. 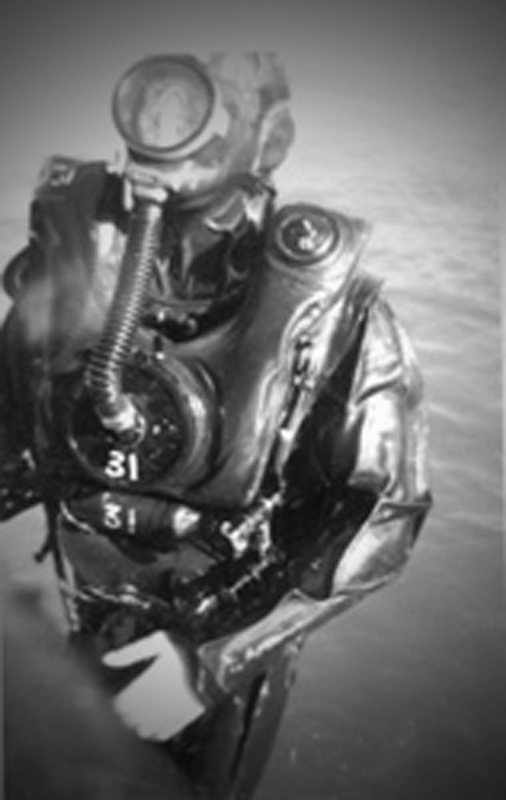 It was not long before some of us had bought dry diving suits manufactured by Dunlop, similar in design to those used by the Royal Navy, but buoyancy aids suitable for divers were still being developed. All our sea dives were from the shore, which often meant swimming some considerable distance before diving, and a tiring swim back to the beach afterwards. Open water training was carried out in Wroughton Reservoir, but only available in the winter months during the closed fishing season, when water temperatures were minimal. 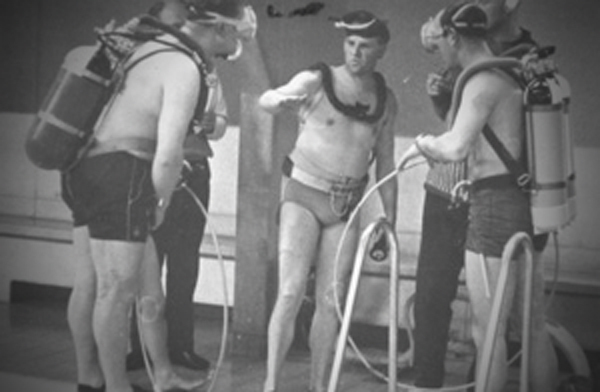 We visited the Royal Naval Diving School at HMS Vernon in Portsmouth two or three times each winter, when we were trained in the use of “Frogman” closed circuit oxygen rebreathing equipment, as used for clandestine diving during World War II. On the end of a shotline, we sometimes swam under the hulls of destroyers in the harbour, which gave us the experience of what the wartime frogmen had undertaken when attacking enemy shipping in enemy ports. We also dived in Standard Diving dress, weighing around 180 pounds, and now as a member of the Historical Diving Society, I still occasionally dive in this equipment on public displays in the London Aquarium and other venues. By the end of 1957 Swindon Branch had grown to 29 full members and 8 Associate members, and the training programme was in full swing. We had acquired more demand valves, ex RAF oxygen cylinders from the local scrap yard, and the more affluent members had purchased diving suits and even their own aqualung. Lead weights were moulded from any scrap lead we could legitimately lay our hands on! 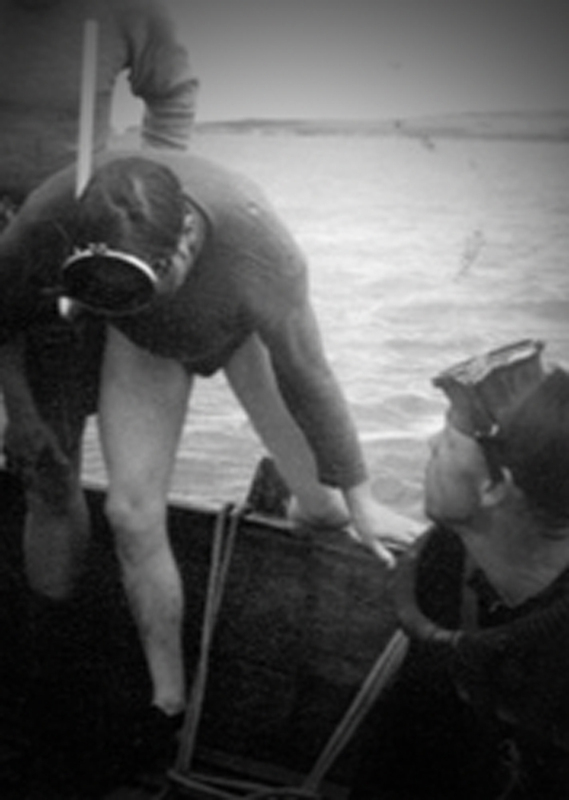 We were later enlisted by the Police as their unofficial underwater search team, and were twice commended, once for recovering, and on another occasion, attempting to recover drowned persons. From there on the story is of gradual progress, which today finds us recognised as one of the foremost branches of the BS-AC, soon to have a new purpose built clubhouse complete with equipment and compressor rooms, boat store, and an impressive array of equipment, RIBS and motors. I am justly proud of being the founder member of Swindon Branch. Not because of my success in getting it off the ground, or perhaps I should say into the water – someone would have done that sooner or later anyway – but because my vision of a strong branch in Swindon, seventy miles from the nearest coastline came to fruition. This was achieved by the unceasing efforts of our officers and members over the years who have made Swindon branch the success it is today.